When I find a composer I like, I tend to explore other shows they have done. This is especially true with some of the newer composers, such as Jeanine Tesori, composer of Thoroughly Modern Millie and Shrek: The Musical (and of the current hit, Fun Home, on Broadway). Back in 2008, one of the shows of Tesori’s I explored was her 1998 Off-Broadway show, Violet. I found that I really liked the music as well as the message. It was revived last year via Encores, but failed to find footing on Broadway (although it was notable for Sutton Foster doing the role without makeup). However, there really hadn’t been any productions that were in reasonable driving distance. That is… until last week. 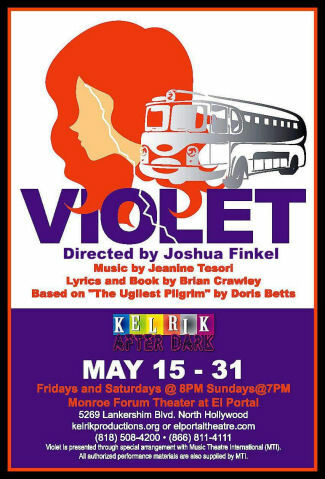 Kelrik Productions, a production company out of San Luis Obispo that has recently started doing shows at the Monroe Forum Theatre at the El Portal (they got rave reviews for their recent Sweeny Todd), has just opened a three-week run of a production of Violet. We saw it last night, and it was just spectacular. It you want a really moving musical, with a great message and wonderful performances, get down to the El Portal before this closes. Violet is well worth it. Violet (Music by the aforementioned Jeanine Tesori, lyrics and book by Brian Crawley, based on “The Ugliest Pilgrim” by Doris Betts) tells the story of Violet Karl of Spruce Pine, NC in 1964. When Violet was 12, an accident with her father and an axe left her with a large facial scar, from cheek to nose. Ever since, she has been teased and grown to accept her ugliness. Keeping her going was a faith healer in Tulsa OK. Now 25, Violet has raised enough money to take Greyhound to Tulsa to be healed. Going through Tennessee, she meets two Army soliders: a black sergeant named Grady “Flick” Fliggins, and a young white corporal named Monty. Both take an interest in Violet. While overnighting in Memphis in a hotel that accommodates blacks, they go out to party and Monty ends up sleeping with Violet (although Violet told Flick she had left the door unlatched). When they arrive at Fort Smith AR, the Monty indicates he will come back Saturday to meet her bus after she’s done in Tulsa. She continues on to Tulsa where she meets the healer… and you can likely predict what happens there. I won’t spoil the details of the end of the story, but you can read them on the Wiki page for the musical. Throughout the show, there are regular flashbacks to young Violet and her father showing their relationship and how she reacted to the scar and the absence of her mother. PS: I also found a wonderful scene breakdown. As I said, this is a show with a strong message — and it isn’t about the charade of faith healers (although there is a strong message of the power of belief). At one point, the phrase “Act ugly, do ugly, be ugly.” is used. In many ways, this is the underlying metaphor for the show. What you believe about yourself, how you behave, is what makes you ugly or beautiful. At the beginning of the show, Violet sees herself, due to the scar, as ugly. Later on in the show, after she believes she has been healed, you can see the change in her — she now believes she is beautiful and through the stint of that belief, transforms. But it isn’t just Violet. We see the soldiers transform from acting ugly to becoming caring people. We see, in the reactions of others, ugliness reflects. What becomes important is not “Act ugly, do ugly, be ugly” but its counterpoint: “Act beautiful, do beautiful, be beautiful.” It is our beliefs and behaviors that dictate how society sees us. Further, given this is the south in 1964, it is how society behaves — beautiful or ugly — that determines what society is. As with the Encores revival, this show is best when it is kept simple. Joshua Finkel (FB), the director, kept is simple. There was no complex set; locations were hinted at through a few props and a digital screen implying the location. There was no elaborate makeup — in particular, neither young nor adult Violet had a visible scar. This emphasized that the real scar was inside, and that sometimes a scar inside is both harder and easier to heal. He used the reactions of the other players to create the impression of the scar. This worked very well. The talent was also top top notch. In the lead female positions were Kristin Towers-Rowles (FB, FB) as adult Violet, and Jaidyn Young (FB) as young Violet. We’ve seen Towers-Rowles before (in Victor/Victoria); she was even better here. Strong singing, strong movement, and strong performance. She made you believe she was a southern girl with a scar solely through behavior alone; it made the transformation remarkable. She was particularly moving in numbers such as “Lay Down Your Head”. Equally strong was Miss Young — whose face kept reminding me of our dear friend Val M. For a 14 year old, she had a remarkable voice and presence, and was just delightful to watch in her various numbers (I particularly enjoyed “Luck of the Draw”, but then again, “Luck of the Draw” is one of my favorite songs). The remaining named positions and actors were all equally strong. Particularly notable were Jason Chacon (FB) with a touching performance as Violet’s father, and Erika Bowman (FB) was a knockout as the Gospel Singer and Landlady. You’ll fall in love with her performance in “Raise Me Up”. Rounding out the excellent cast were Richard Lewis Warren (FB) (Preacher / Bus Driver), Gail Matthius (FB) (Old Lady / Hotel Singer), Benai Alicia Boyd (FB) (Music Hall Singer / Mabel), Jeremy Saje (FB) (Waiter / Mechanic), and Justin Anthony Long (FB) (Billy Dean / Virgil). With the ensemble, notable numbers include the opening (“On My Way”) and the touching “Who’ll Be the One (If Not Me)”. The choreography by Stage Manager Samantha Marie/FB made effective use of the limited space in the Forum theatre, particularly in the opening number and in the gospel numbers. Music was under the direction of Joe Lawrence (FB), who also played keyboard on-stage. Joining him were Barrett Wilson/FB on guitar, and in the back, Jason Chacon (FB) providing percussion. The set design by Erik Austin (FB) [the “rik” in the producing team] was simple but effective, and served to focus attention on the actors. Props were provided by Lester Wilson/FB; I particularly liked the attention to detail in the Greyhound tickets. The lighting design, also by the choreographer Samantha Marie/FB served well to focus attention and create the mood. There was no credit for sound design; I seem to recall some effective sound effects (but perhaps my mind is playing tricks on me). The costumes by Kathleen Forster/FB, for the most part, were good. I only had one quibble (probably because I work with the Air Force, who use the same insignia as the Army): although Grady’s insignia were correct for a Staff Sergent (three chevrons, one rocker), Monty’s were wrong for a Corporal (a CPL is two chevrons; Monty only had one making him a Private E-2). The wigs by Debi Hernandez worked well. Samantha Marie/FB was the stage manager, assisted by Lainie Pahos/FB. Violet was produced by Kelrik Productions (FB). The Los Angeles premiere of Violet continues at the Monroe Forum Theatre at the El Portal (FB) through Sunday, May 31. It is well worth seeing for the great music and the great story. Tickets are available through OvationTix; discount Goldstar tickets are sold out (you snooze, you lose). Go see it. Upcoming Shows: Next weekend brings Confirmation services at TAS, a visit to the Hollywood Bowl, and “Love Again“, a new musical by Doug Haverty and Adryan Russ, at the Lonny Chapman Group Rep (FB). The last weekend of May brings “Entropy” at Theatre of Note (FB) on Saturday, and “Waterfall“, the new Maltby/Shire musical at the Pasadena Playhouse (FB) on Sunday. June looks to be exhausting with the bounty that the Hollywood Fringe Festival (FB) brings (ticketing is now open). June starts with a matinee of the movie Grease at The Colony Theatre (FB), followed by Clybourne Park (HFF) at the Lounge Theatre (FB) on Saturday, and a trip out to see the Lancaster Jethawks on Sunday. The second weekend of June brings Max and Elsa. No Music. No Children. (HFF) at Theatre Asylum (FB) and Wombat Man (HFF) at Underground Theatre (FB) on Saturday, and Marry Me a Little (HFF) by Good People Theatre (FB) at the Lillian Theatre (FB) on Sunday. The craziness continues into the third weekend of June, with Nigerian Spam Scam Scam (HFF) at Theatre Asylum (FB) and Merely Players (HFF) at the Lounge Theatre (FB) on Saturday, and Uncle Impossible’s Funtime Variety & Ice Cream Social, (HFF) at the Complex Theatres (FB) on Sunday (and possibly “Matilda” at the Ahmanson Theatre (FB) in the afternoon, depending on Hottix availability, although July 4th weekend is more likely). The Fringe craziness ends with Medium Size Me, (HFF) at the Complex Theatres (FB) on Thursday 6/25 and Might As Well Live: Stories By Dorothy Parker (HFF) at the Complex Theatres (FB) on Saturday. June ends with our annual drum corps show in Riverside on Sunday. July begins with “Murder for Two” at the Geffen Playhouse (FB) on July 3rd, and possibly Matilda. July 11th brings “Jesus Christ Superstar” at REP East (FB). The following weekend is open, although it might bring “Green Grow The Lilacs” at Theatricum Botanicum (FB) (depending on their schedule and Goldstar). July 25th brings “Lombardi” at the Lonny Chapman Group Rep (FB), with the annual Operaworks show the next day. August may bring “As You Like It” at Theatricum Botanicum (FB), the summer Mus-ique show, and “The Fabulous Lipitones” at The Colony Theatre (FB). After that we’ll need a vacation! As always, I’m keeping my eyes open for interesting productions mentioned on sites such as Bitter-Lemons, and Musicals in LA, as well as productions I see on Goldstar, LA Stage Tix, Plays411.